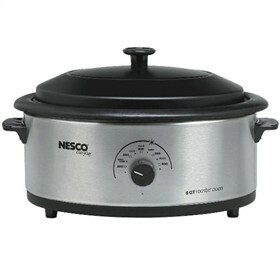 The Nesco 4816-25-30 is a 6 Quart roaster that is convenient in size to cook food for upto six people. It is ideal for making a batch of chili, soup and stews. It features a removable chrome rack for better baking and fat-free roasting. The patented Nescote® non-stick interior makes the roaster easy to clean. This steel cookware is designed to roast, bake, cook, steam, slow cook and serves all in one. The patented unique circle of heat™ heating element provides moist and even cooking. The Nesco 4816-25-30 has many exciting features for users of all types. You can extend the lifetime of your Nesco 4816-25-30 with the purchase of a FactoryOutletStore Factory Protection Plan. See the Nesco 4816-25-30 gallery images above for more product views. The Nesco 4816-25-30 is sold as a Brand New Unopened Item.